6. Player hits forehand volleys. 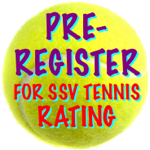 SSV Tennis is a rating test and a competition! The SSV Tennis Rating gives you a rating between 0 & 200. There are 8 levels of play from beginner to expert. San Diego, Los Angeles and Orange County. 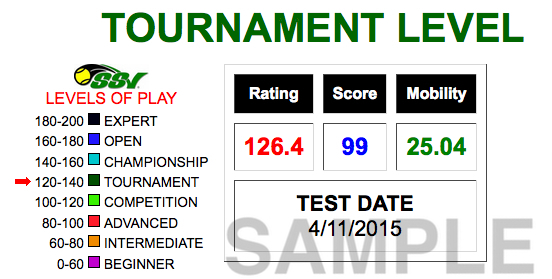 The SSV Tennis Rating determines levels of play. Age and gender are not factors, only tennis ability. Step One: Get Rated! Step Two: Sign Up To Play!